We only supply new, respected, “non-grey” import brands of computers, peripherals and network hardware. KONDURA TECHNOLOGIES does not supply any component or computer based purely on a price basis. After-sales support from our supplier is our priority in selection of hardware we sell. It is most important to us that the warranty our supplier offers is actually worth something to our customers. It matters to us if the supplier is reputable and how efficient the supplier has been in the past in dealing with previous warranty claims. We follow trends in the market, read about issues with certain components and wherever possible, sell the most reliable models. For computers and servers, we have found the hardware quality and support of Hewlett Packard (HP) and Dell to rate among the highest in suppliers of computer hardware in the Port Elizabeth area. For notebooks, we have found that the Hewlett Packard™ and Dell™ range of notebook cmputers to offer quite good local support. 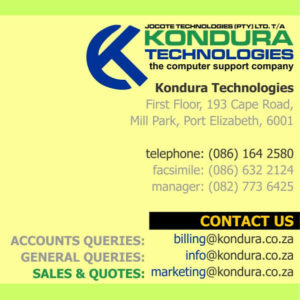 Unlike most other notebook brands, most repairs and replacements are usually done in Port Elizabeth on these units. For any other peripherals, cameras or scanners, usually we sell brand names like Canon™, Hewlett Packard™ Printers, Microsoft™ operating system software and hardware. For File Servers or PC’s, we install Microsoft™ Server Solutions. Please note that we have discontinued support for Linux and Novell. For Anti-Virus and Security, we support the ESET NOD32 range of products and are an authorized dealer. We support Apple, iPad, iPhone, Android Operating systems on mobile devices and tablets. We are a MICROSOFT™ Partner and committed to supplying legal software to our customers. We do not sell second-hand items, nor any locally made assembled “clone” PC’s as we prefer the consistent quality assurance of the international brands of HP and DELL. Other brands we may occasionally sell will usually have internationally supported warranties wherever possible.